This Christmas, Emu Productions, the producer behind the Australian premiere of Jungle Book - The Musical and the sell-out production of Roald Dahl's George's Marvellous Medicine, is proudly presenting the Australian premiere of Rapunzel - The Pantomime. Running for a strictly limited season at King Street Theatre, this Christmas pantomime for the young at heart has been adapted and directed by Maria de Marco (playwright of Mother Goose and Mother Goose in the Woods). Inspired by the classic Brothers Grimm tale, Maria de Marco's Rapunzel has a unique Australian twist and a lot more than just Rapunzel letting her hair down! The Maiden in the Tower or Rapunzel is taking charge and breaking out of her digs with no door and no stairs. Problem is, the only way down is her hair. Or can Prince Charming save her? Prince Charming is looking for the maiden with the other glass slipper or is he looking for the maiden in the glass coffin? With all these bachelors on the loose in the woods, how will she decide which one is her soulmate for life? Rapunzel - The Pantomime follow the success of pantos at King Street Theatre in 2014 and 2015 and is sure to delight the whole family this festive season. The cast features Jacqui Greenfield as Rapunzel, Thomas Adams, Alex Chorley, Simon Ward and a special guest appearance from Santa Claus. "De Marco's show easily manages to avoid most of the age-old puns, and brings something new for your young children to see this Christmas season. "Lynn Belvedere, Sydney Arts Guide, December 2015. 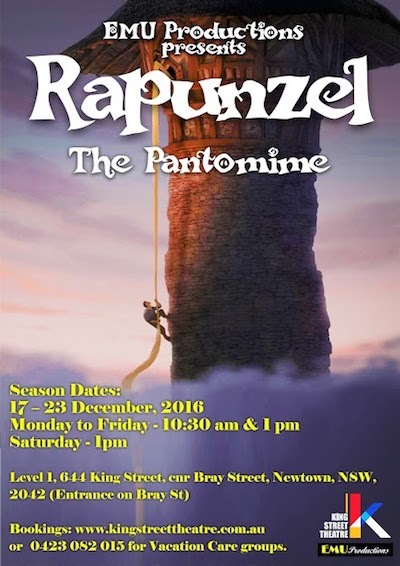 Rapunzel - The Pantomime will play at King Street Theatre from 17 to 23 December 2016. Performances will be held Monday to Friday, 10:30 am and 1 pm and Saturday at 1pm. Duration is approximately 60 minutes. Rapunzel - The Pantomime is recommended for ages 4 and up. (Please note babes in arms and all children under 2 are free, but must book a seat for the show if sitting in a seat). Tickest are now on sale through www.kingstreettheatre.com.au or call 0423 082 015 for Vocational Care Groups.